Looking for a great holiday gift for your outdoorsy kids this Christmas? 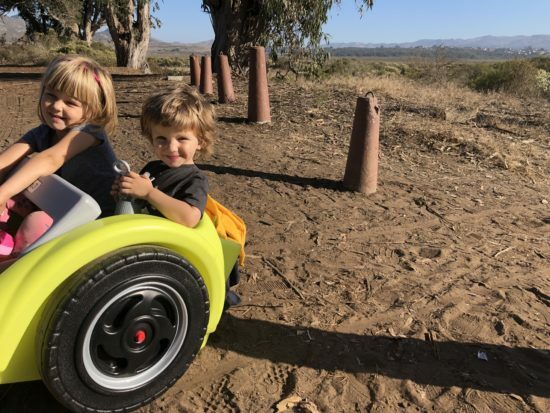 Simplay3‘s new Trail Master 2-Seat Wagon is such a fun option! 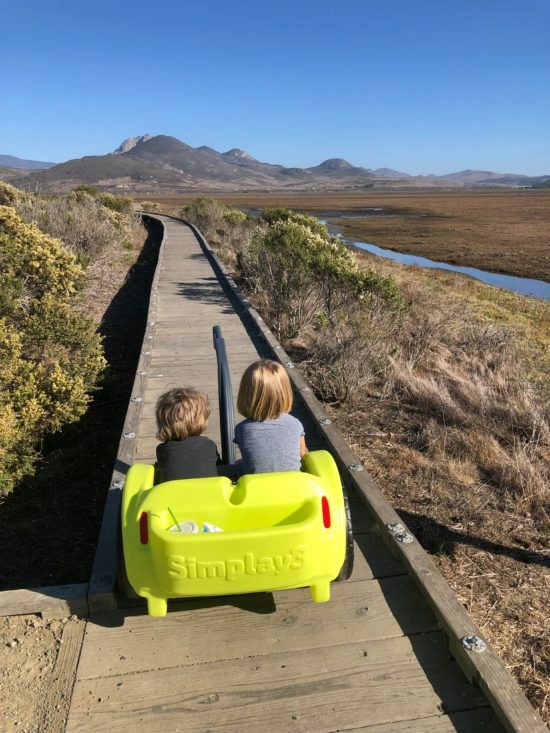 We received the wagon compliments of Simplay3 to review, but all opinions are my own. For more info on all that, see my disclosure. 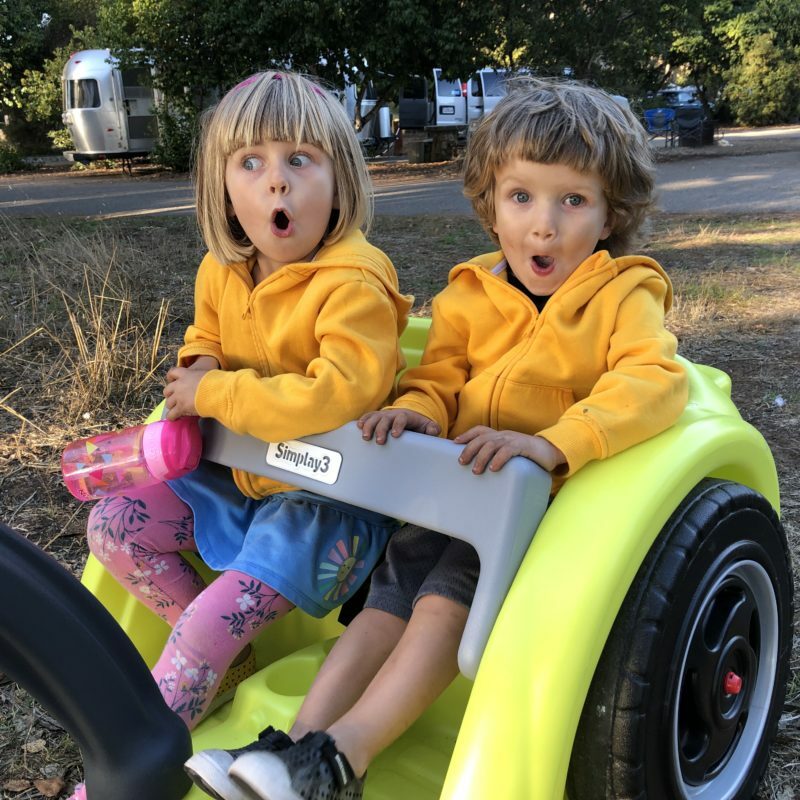 The Trail Master 2-Seat Wagon features an ergonomic design with two wheels, a high back seat with lap bar and seat belts for two kids. 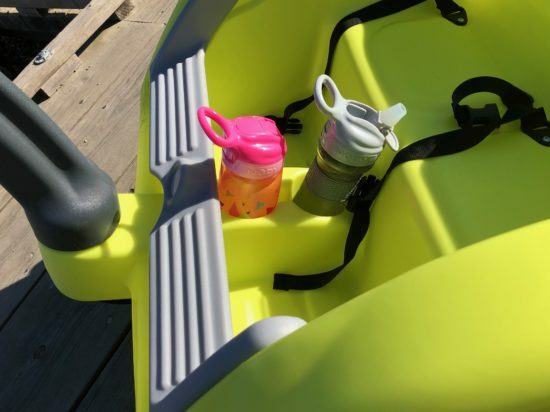 Its heavy duty plastic structure weighs 19 pounds and is made for kids ages 1.5 to 4 years old. 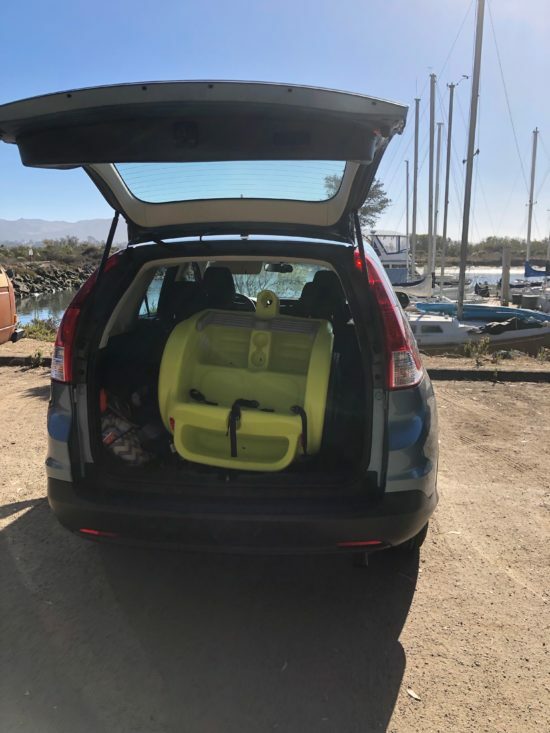 It also features rear reflector decals for nighttime safety and a tether for the optional shade umbrella purchased separately. 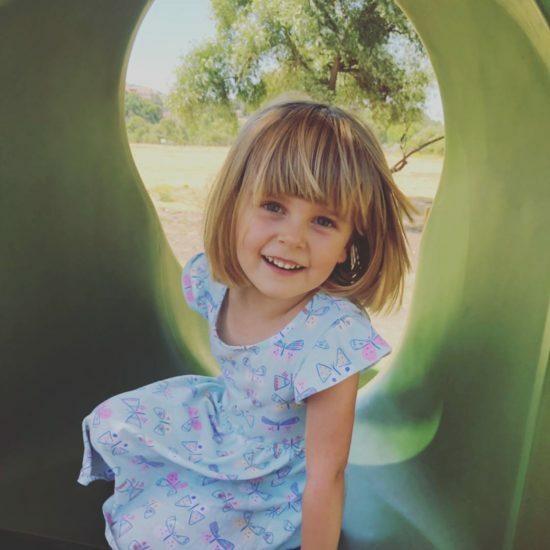 At age 2 and 4, the kids and I just started to ditch the stroller for our outdoor walks, which is a major milestone. 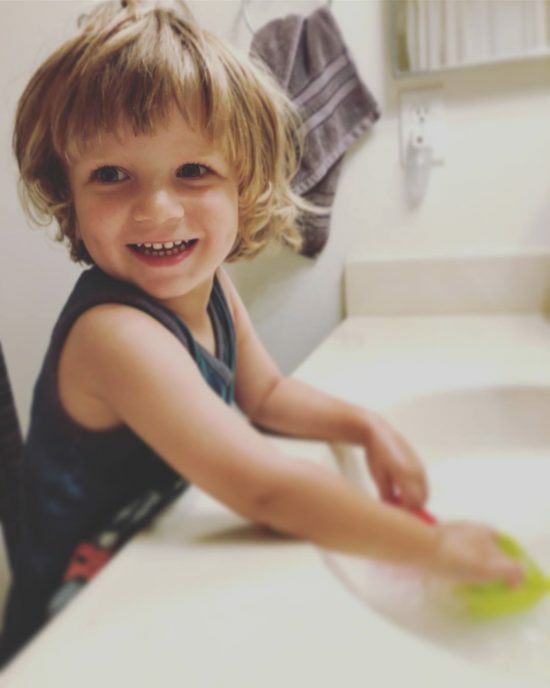 I was never big on stroller walks anyway, because when the kids were smaller they would always whine for snacks and water cups (and toss said cups on the ground). So the walks were SUPER SLOW, and kind of drove me crazy. So then came the plastic push-bike era, which was handy for wrangling the baby but big sis got jelly and two kids didn’t fit on one bike, and I couldn’t push two by myself. By the time the Trail Master 2-Seat Wagon entered our lives, I had achieved official packmule status carrying all the things on these stroller-free walks. I was eager to find a solution. And clearly, this wagon was it. 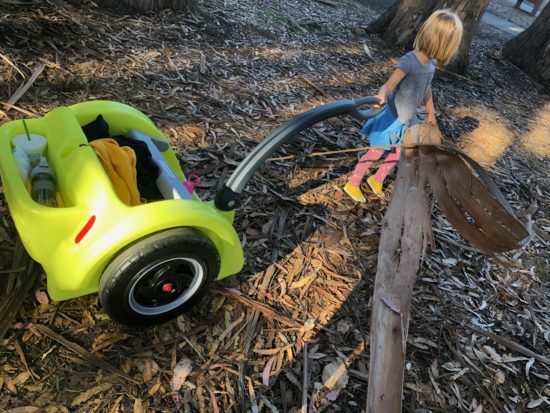 Overall, it’s a cool outdoor toy that offers a new style for adventuring. It takes tight turns, works out my arms and the kids love riding in it. Its extra wide wheels also make riding over different surfaces a breeze. 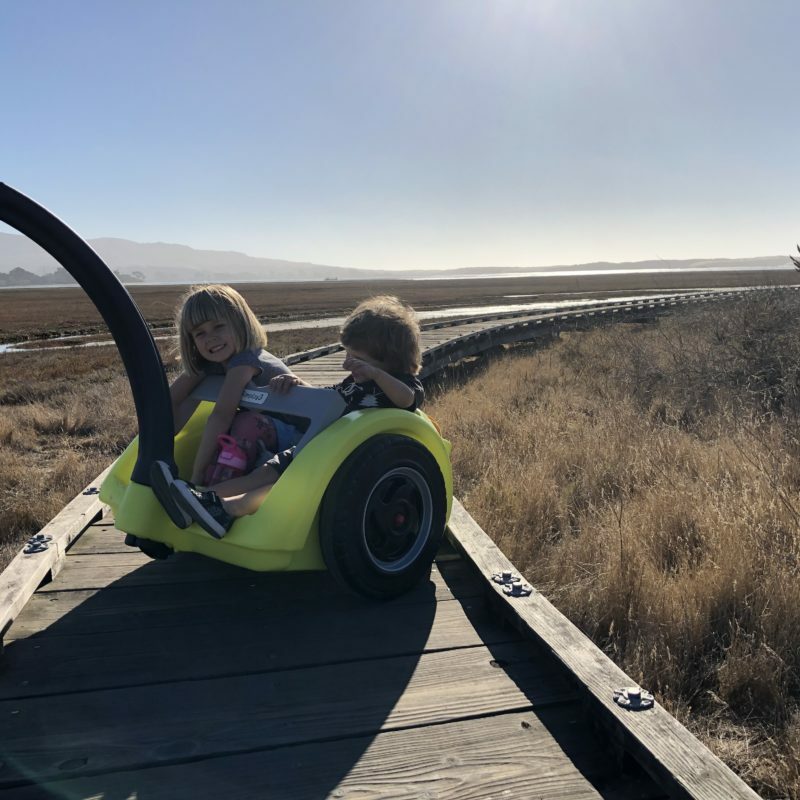 Unlike other wagons, this two-seater is designed so both kids are front and center, facing forward for the ride – which, for us, goes a long way. In fact, all of its features are pretty cool. It comes with built-in cup holders and backend storage – perfect for all those extras I hated carrying before. 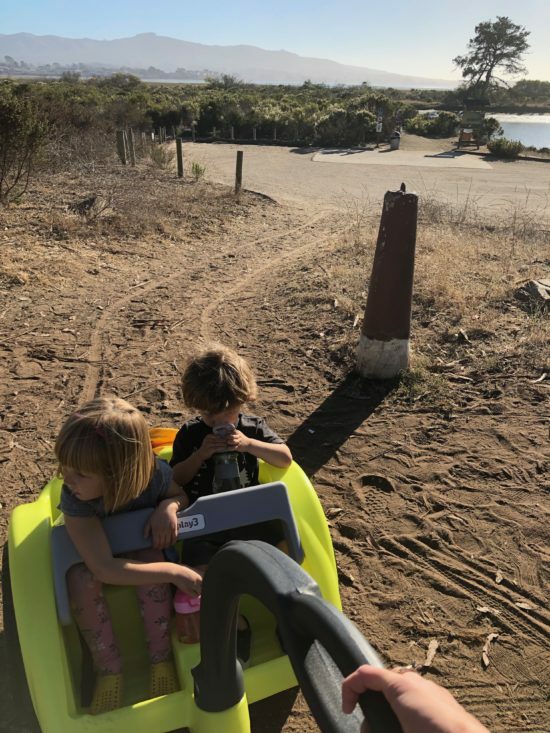 When we got the wagon out on the trail, I liked everything about the way it felt, except for one thing. 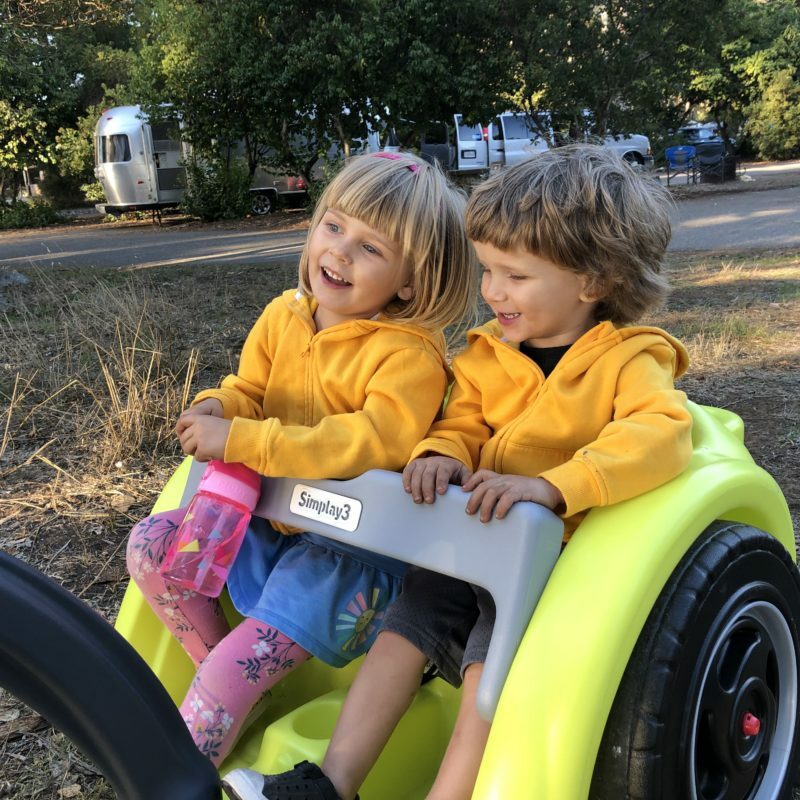 Which I think is an easy fix: When holding the handle with the kids riding behind me, I had to lift my arm just so in order to find the perfect height balance between the ground and smooth riding. If I misjudged, the based of the handle made an audible scraaaaape against the ground. So that’s something that could leave some room for improvement. But I’m thinking of popping one of those soft-bottom felt pads used for furniture onto the base of the handle bar to prevent the scrape feeling. 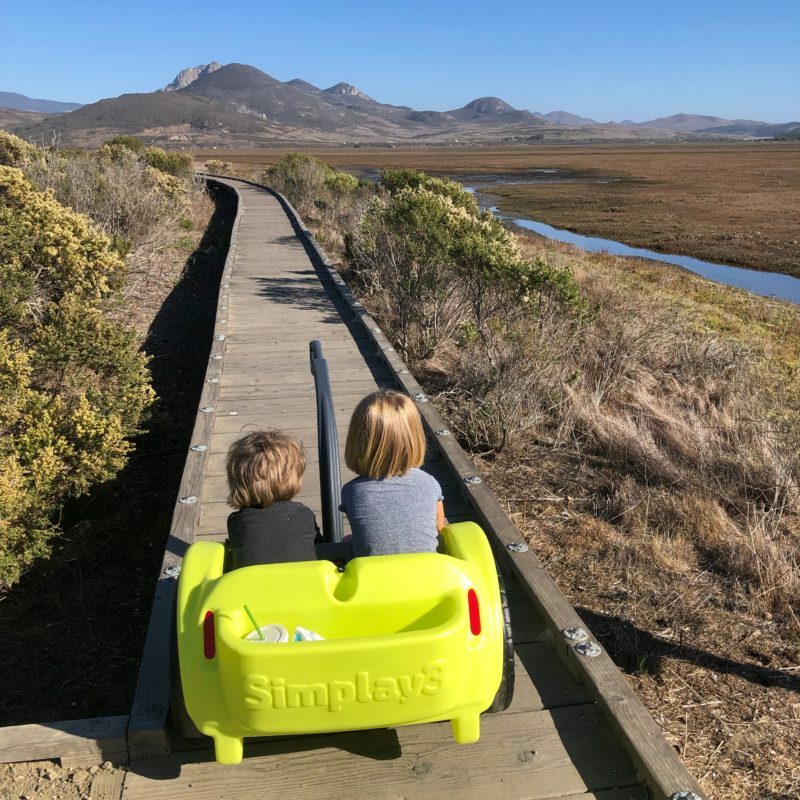 We decided to take the wagon on the open road over to the Morro Bay Marina Boardwalk in scenic Morro Bay, California. 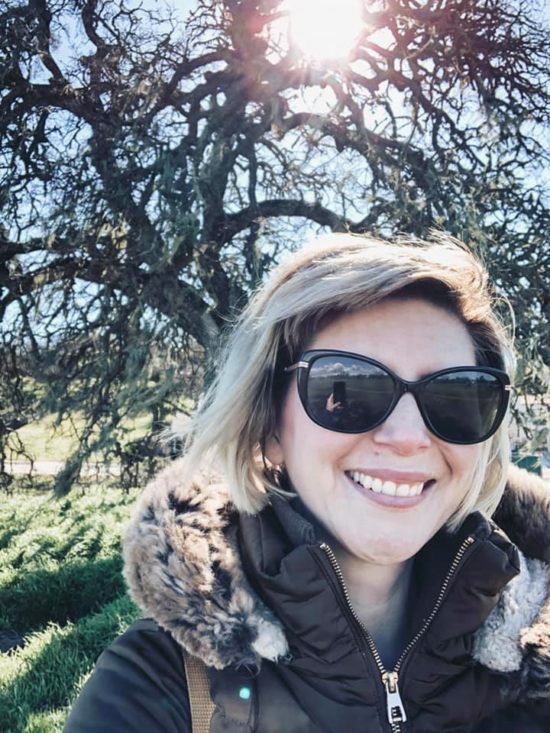 This Central Coast fishing town is about 40 miles west from our house in inland Paso Robles, so it makes for the perfect day trip. 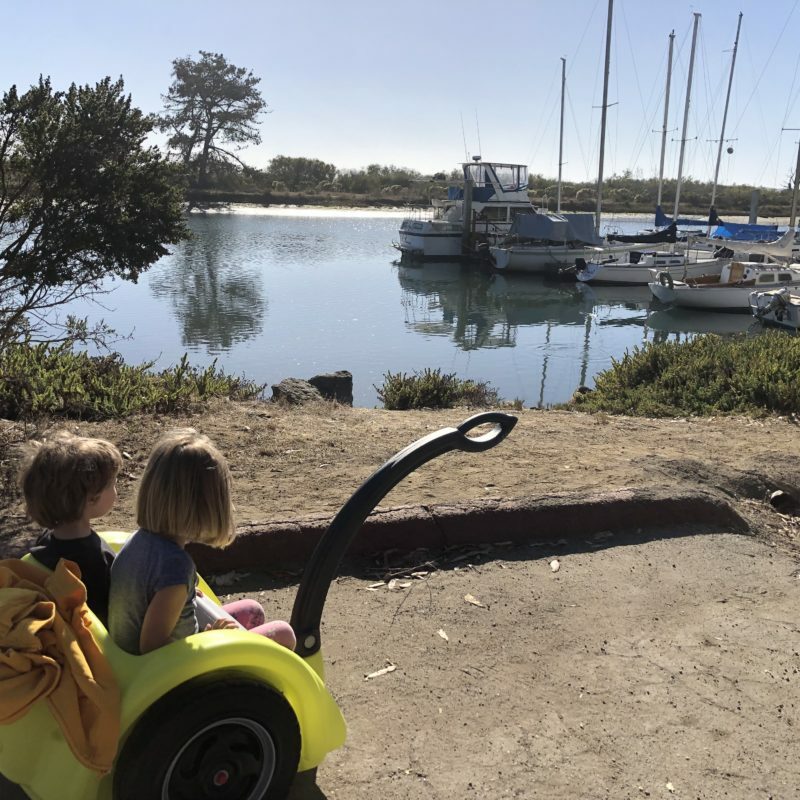 I have thoroughly explored Morro Bay in the past, (check out my Morro Bay Embarcadero With Kids post here). 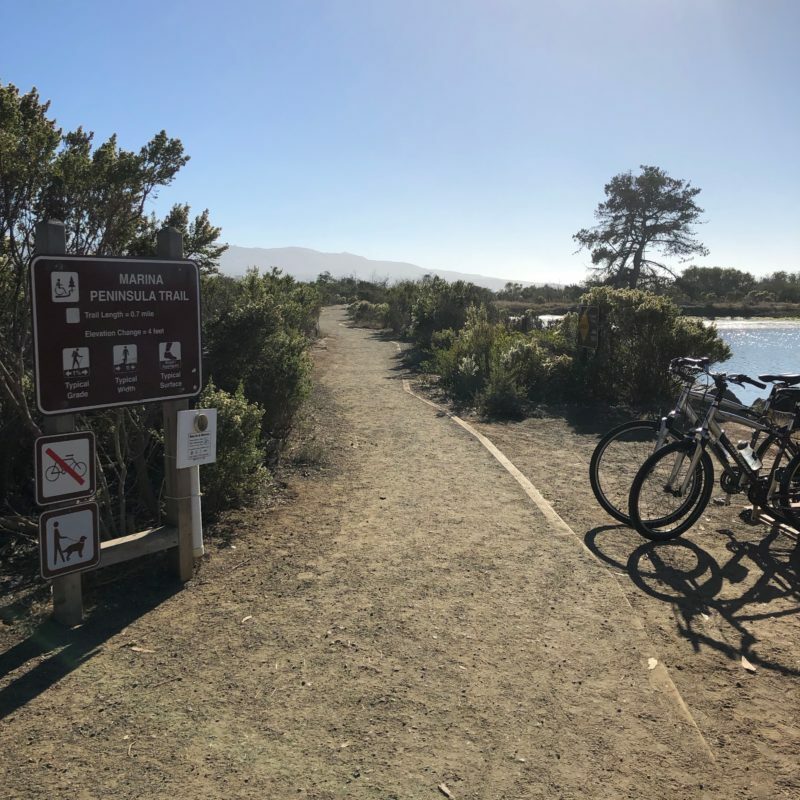 But when I went kayaking with my SLOCAL crew this summer, I spied the boardwalk trail way over on the south side, and I had never known it was there. 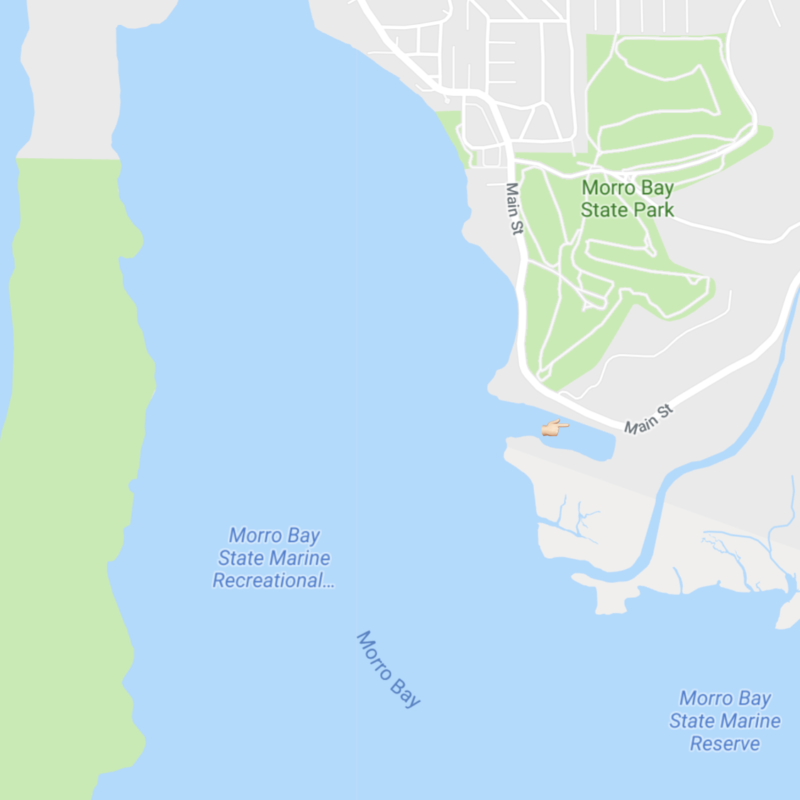 The trail meanders off shore in a much smaller part of the harbor and leads hikers to an overlook of the estuary. I had always wanted to go back there to test out the walk with the kids. And the wagon was the perfect addition for such an adventure. 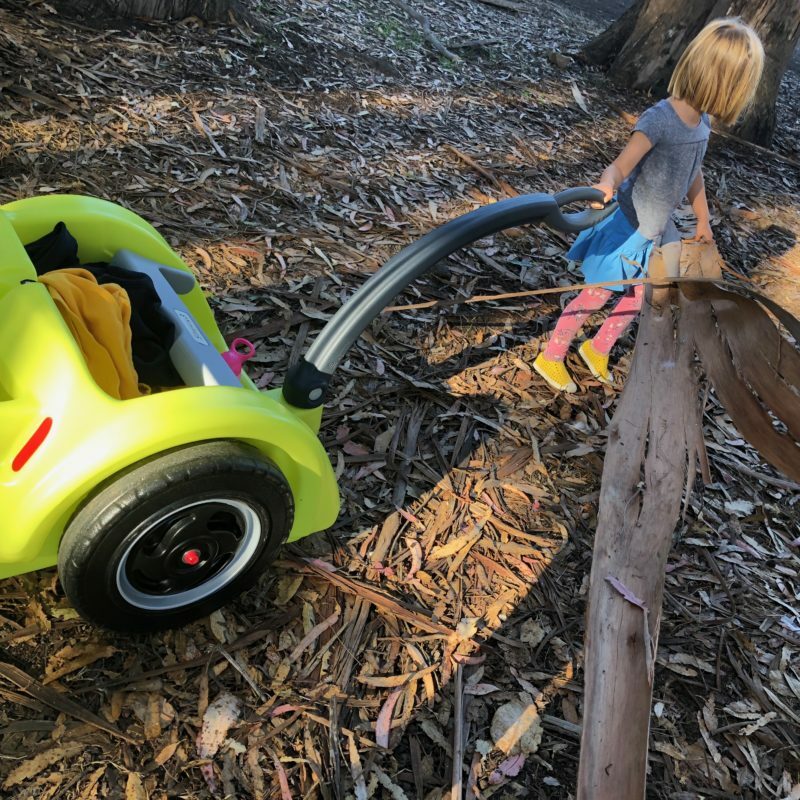 For us, these plastic wheels boasted an extra-wide shape that easily rolled over soft dirt, crunchy fall leaves, bumpy boardwalk slats, rough asphalt – you name it. In fact, the whole toy is super easy to navigate. It’s great on tight turns, specifically. We even were able to make several u-turns on the narrow boardwalk which I was surprised about. It also didn’t feel heavy to pull behind me. 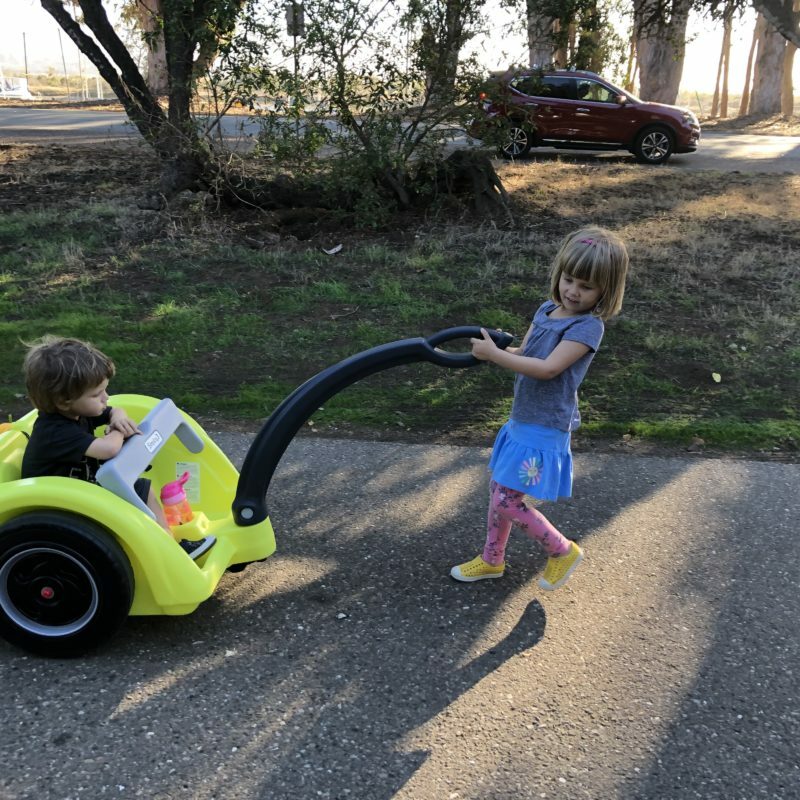 Clara was even able to pull her brother around. Roomy and easily accessible for little hands. All in all, we recommend this toy to families on-the-go. Even with the one suggestion for the company to take a look at improving the scraping issue. Thanks for the adventure, Simplay3! Wondering about Simplay3? The brand is not so new. 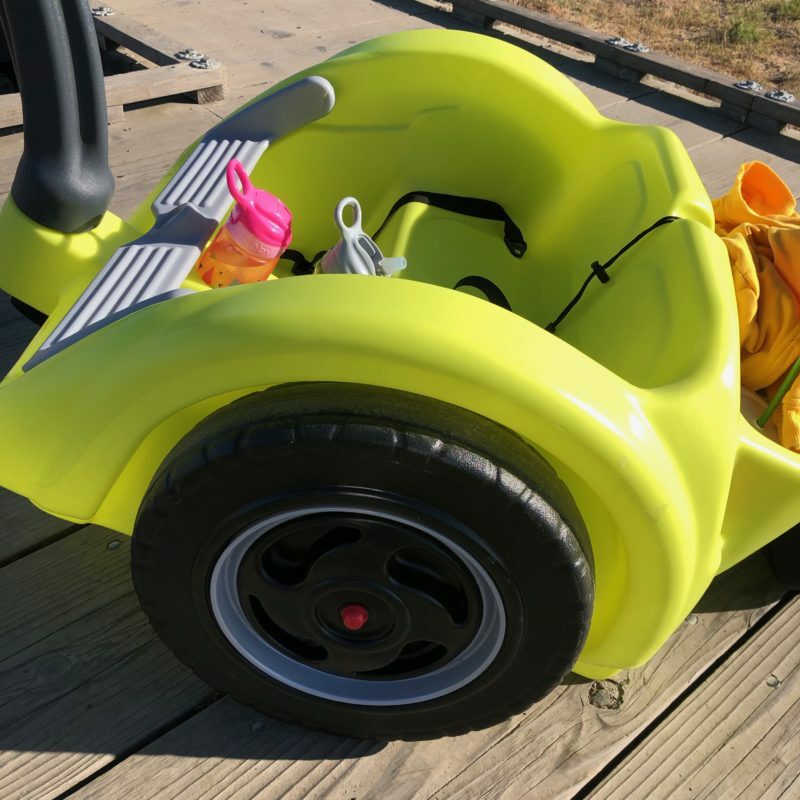 This Ohio-based company comes from its founders who first led the popular companies Little Tikes and Step2. Follow Simplay3 on social: Instagram, Facebook, Web.